GRAMMY®, TONY®, and EMMY® Award-winning singer-songwriter, arranger, producer and musician Barry Manilow announced on April 27 that he will be returning to Las Vegas with a brand new stage production to perform his extensive catalog of hits as the exclusive headliner at the Westgate International Theater at Westgate Las Vegas Resort & Casino. The legendary entertainer will return to where he previously made his spectacular residency debut on February 24, 2005. The 85-minute show will celebrate his well-loved greatest hits. "I have nothing but great memories of my seven years performing in Las Vegas," Manilow said. "I'm very excited to be returning. Get ready, Las Vegas! Here I come!" "Barry Manilow is an icon and one of the world's greatest performers," David Siegel, Founder & CEO of Westgate Resorts, said. "We are thrilled to be welcoming him back to our historic stage so that he can once again make it home. Our guests will be delighted by his repertoire of more than 50 Top-40 hits." Tickets will range in price from $19.75 to $329.75 plus tax and applicable fees and will go on sale May 2 at 8 a.m. PT. Show dates going on sale will be May 24-26, June 14-16, June 21-23, July 19-21, July 26-28, Oct. 4-6 and Oct. 11-13. Barry Manilow fan club members and Westgate Resorts Owners have had access to a pre-sale beginning April 27 at 11 a.m. PT. 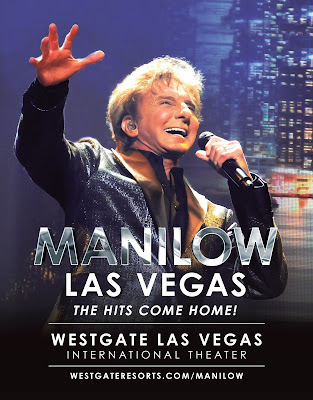 For more show and ticket information, please visit BarryManilow.com or WestgateLasVegas.com. Westgate Las Vegas Resort & Casino, a legendary world-class destination, offers a unique blend of amenities and excitement with all your favorite table games, hottest slots on the market, incredible restaurants, endless entertainment, more than 225,000 square feet of meeting space and the world's largest Race & Sports SuperBook®, which is home to Nevada's largest wagering system and more than 4,488 square feet of state-of-the-art HD video screens, in a comfortable, smoke-free environment. Westgate Las Vegas provides a range of culinary adventures with eight restaurants, including the world-famous Benihana, the award-winning Edge Steakhouse and the newest addition Fresco Italiano. The property features entertainment options in the International Theater and the Westgate Cabaret and has recently undergone a more than $150 million renovation, that has encompassed every square inch of the property, including the addition of 300 timeshare villas, the all-new International Bar, a fully renovated pool deck, 1,200 remodeled Signature Rooms and the luxurious Serenity Spa, which was recently awarded the 2017 Forbes Travel Guide Four-Star Award. For more information or to book accommodations, call toll free at (800) 732-7117 or log on to WestgateVegas.com.